Thursday October 25th 1883. I was at home all day. I knit what time I could get and finished the mittens. I wrote a short letter to Mother. 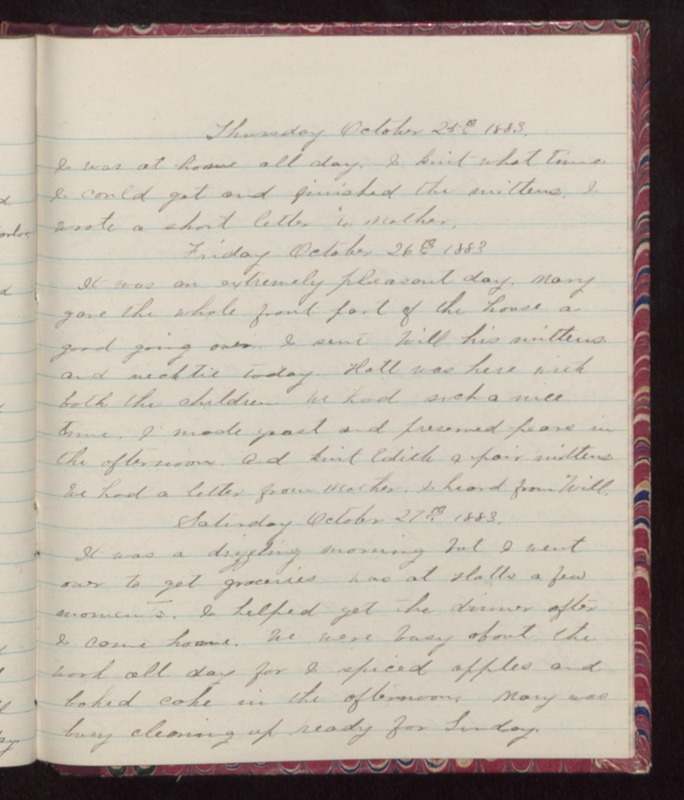 Friday October 26th 1883 It was an extremely pleasant day. Mary gave the whole front part of the house a good going over. I sent Will his mittens and neck tie today. Hatt was here with both the children. We had such a nice time. I made yeast and preserved pears in the afternoon. And knit Edith a pair of mittens We had a letter from Mother. I heard from Will. Saturday October 27th 1883. It was a drizzling morning but I went over to get groceries Was at Hatts a few moments. I helped get the dinner after I came home. We were busy about the work all day for I spiced apples and baked cake in the afternoon. Mary was busy cleaning up ready for Sunday.